Marcus was dreaming or perhaps it was a nightmare. He saw Hashar in what must have been Bugbear hell. Hashar was marshaling some of the Bugbear forces against a Bugbear demon lord with a pitchfork. They were arguing. Marcus felt sick and awoke in a sweat. He immediately reached out to his friend Quintos, waking him. As Quintos asked why Marcus would disrupt his sleep, the alcohol still on his breath, Marcus seeing that Quintos did not appreciate the nudge awake, he went to Lundie to discuss this nightmare. They discussed, wondering if Hashar’s power was stronger than they realized and what foul plot or battle in Bugbear hell that Hashar was leading. Marcus in a strange way, admired his leadership potential. Moments latter, Ghostdancer walked into the camp, he had left to do some research. He told us of a library, he just visited called Elinae’s reliquary. At this place, he investigated a strange Earth creature the “Buffalo”. During his studies he found an island called the Isle of Vridensia. Quintos recovering from his hang over, hearing the name recalls some lore he studied during his arcane training. Quintos stated the Isle, during the second age, was a place that wizards brought many of the creatures of Earth to Thrëa. Creatures like Minotaurs, Gorgons, Cyclops, etc. Quintos was not sure of the reason for this action. After a reasonable or questionable breakfast cooked by Marcus, the party decided to head back into the Castle at Bone Hill in search of the first gem of Uthjarl. Quickly walking down to the room of the statues Lundie said a prayer to Caldrindia’s (Archion) Avatar. The party, then saw a seven foot tall rock slide blocking part of the entrance behind the statue, there was a three foot gap at the top. Peering inside the party and saw a mirror. 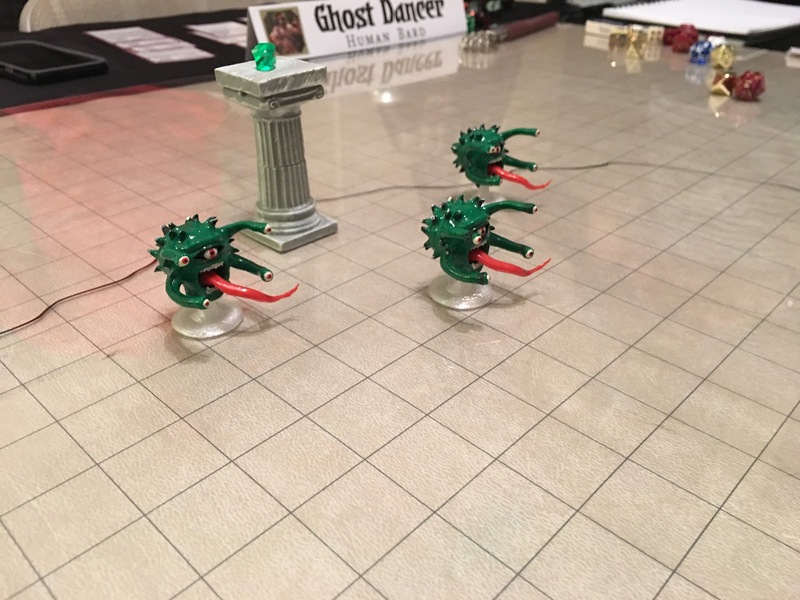 After much discussion, Ghost Dancer volunteered to go into the room. Marcus tied a rope around his friend in case we needed to drag him back. As Ghost Dancer entered he disappeared. Marcus got very concerned he just lost his friend. It seemed like he was teleported or had traveled possibly to another plane. Marcus rushed into the room, and looked into the mirror to help his friend, knowing he would NEVER leave a man behind. The rest of the party entered and started to carefully search the room and observe the mirror. Quintos, more thoughtfully, decided to use the crystal ball to attempt to locate his friends. Ivamel agreed based on his experience with planar travels. The warlock started his scrying, a process that would take approx 10 minutes. Meanwhile, Ghost Dancer appeared in a pocket dimension, called a mirror dimension. He was on an infinite plane. As he looked around he saw an exact duplicate of himself appearing some 150 feet away. Then seconds latter Marcus, his friend and ally, appeared by him. Then Marcus’s mirror clone appeared 150 feet away next to Ghost Dancers mirror clone . Suddenly, the fight was on a Mirror clone vs. originals a fight to the death. The battle was ultimately won by the originals, defeating their mirror clones. Ghost Dancer single handedly defeated the Marcus clone with heat metal and shatter spells. Marcus in the early pary of the battle seemed disoriented in the mirror plane and seemed disconnected from his gods power, his accuracy was off. Then Ghost Dancer pivoted on his own mirror clone and used Tasha’s insidious laughter to drop his own clone to the ground laughing, incapacitated. 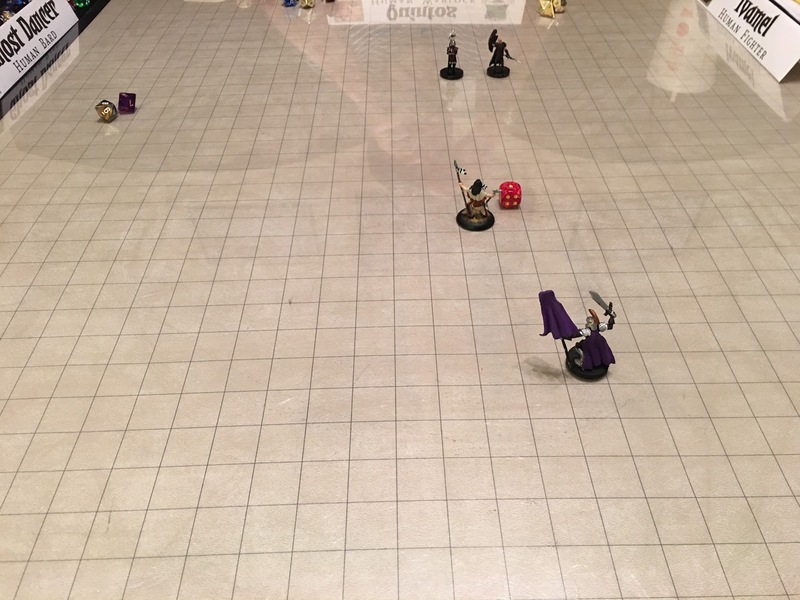 Marcus, seeing an opening, abandoned his spell casting, and used his spear quickly charged over and cut the head off Ghost Dancers clone. As the clone fell, the two appeared back into the real world. Once again re-united with their friends, but drained of our magic spells in the fight. We decided to take a long rest to recoup our spells. During this time we spotted a bug bear skeleton wandering outside the mirror room, it walked away with no conflicts. So we headed out, down the corridor and found a large door, locked. Ivamel skillfully picked the lock, but even that did not open the door. It was magically locked. So after some discussion, and a quick journey down the hall to find another door, we returned to this door. Ghost Dancer placed a silence spell on the door, while Quintos blasted it with his Eldrich blast while Marcus pitched in with his Sacred flame. As the door broke open, inside we saw 3 floating eyes with long tongues and 4 eye stalks each. These creatures, called Spectators looked like the cousins of a beholder. And then we saw on a large pillar the beautiful emerald gem of the Uthjarl gleaming. The focus of our quest was in sight. We must defeat these creatures. 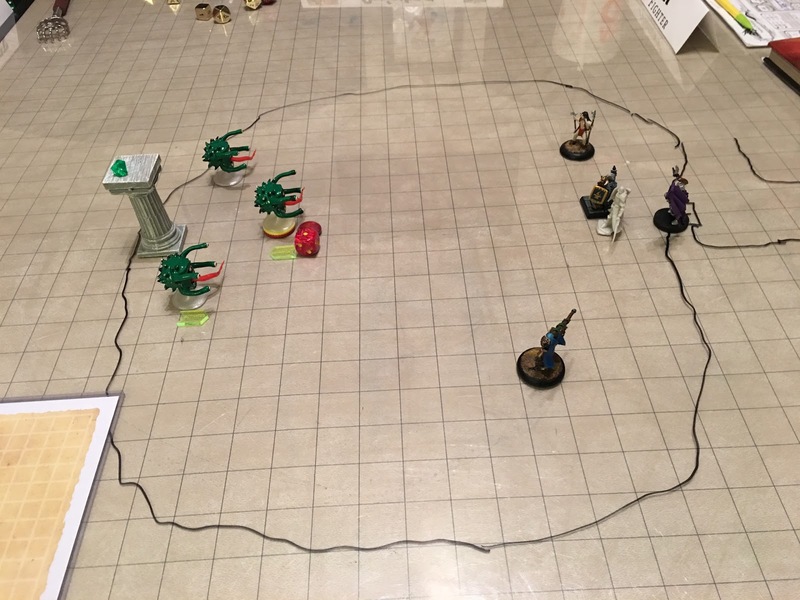 Our party started a long battle, it was glorious, each member playing a role. Ivalmal and Lundie advanced into the room to protect the casters, drawing the attentions of the creatures. Ivamal was the target of many rays from the eye stalks of these evil creatures, being paralyzed and confused. Lundie charged forth absorbing rays of pain, healing himself as he marched towards these villainous foes. Quintos threw Edrich blasts, Qhost Dancer cast Shatter, Marcus used his spiritual weapon a spear from Mars and cast a burning beams of holy light at the creatures. Ultimately, Quintos turned the tide of the battle with his dragon staff, he fired a bolt of lighting that destroyed one of the creatures (who was wounded) and seriously damaged a second, who was quickly dispatched. Then the full might of our heros destroyed the third and final Spectator.